Our Golden Oliver led the way when our site came online in 1997. And, his valiant struggle and loss to lymphoma helped us channel our efforts in more healthful and holistic ways. Yet, even with reduced vaccinations, filtered water, a chemically-clean environment, organic foods, and more, we did not escape a fibrosarcoma diagnosis with our Golden Darcy in 2005. Their images, along with other Goldens who have lost such battles, are honored above. In October 2006, we learned about Harley, a Golden boy from San Antonio. The discovery of a brain tumor compounded difficulties his mom, Andrea Hanssen, was experiencing due to being a widow, single mom, and nursing student. The huge costs of treatment took her entire savings. But, Andrea continued on, her positive spirit present even though Harley was not well enough to continue his visitations to wounded soldiers at the Brooke Army Medical Center. We provided a special fundraiser for Harley, raising over $10,000 to cover his medical bills. The amount we can extend ($1,000 per dog) is small, when one considers the enormous cost of scans, surgery, chemotherapy, and radiation therapy. However, it allows more dogs to be helped. But your help for a specific dog could make a huge difference. Remember, whatever you donate, always goes directly to the treating veterinarian or veterinary specialist. And, it is tax-deductible as well, which means a win-win for all. Our grants are $1,000 per individual full-time working dog partner, the reimbursements provided directly to respective veterinary personnel for oncology related expenses in the United States and Canada. All breeds/mixes may apply. Applicants MUST have been active, full-time working dogs at the time of cancer diagnosis, in the areas of assistance, detection, search & rescue, enforcement, military work, or animal-assisted therapy*. Dogs over 10 are exempt as service dogs are retired by that age (and statistically, after the age of 10, cancer is considered a disease of old age). All applicants must prove that their dogs have been professionally trained and certified. 1. Click here to download the [PDF] Cancer Treatment Fund Grant Application. Complete and snail mail your downloaded application to: Land of PureGold Foundation, 3731 Greenway Lane, Owings Mills, MD 21117. Be sure to include copies of all the required documents. 2. Send an email (foundation at landofpuregold dot com) informing us that you have downloaded a grant application. In the email, detail the job that your dog provides and a biography of his/her life, including his/her recent cancer diagnosis. Also, include photos of your dog, and yourself with your dog if you'd like. This will be placed online if your application is approved. We will pay $1,000 toward treatment costs within 14 days of receipt, if the application meets established criteria. Supportive supplements, to augment the dog's current cancer treatment regimen, may also be provided by Suzi Beber, Smiling Blue Skies Cancer Fund founder. *Animal-assisted Therapy Dogs must be providing at least 30 hours weekly to qualify. They can be full-time facility dogs in assisted living homes or providing therapy in a professional setting (e.g., working with a speech, physical therapy, or occupational therapist; working in a school 5 days weekly; etc.). Animal-assisted Visitation Dogs are no longer included in our grant program. We have helped close to 40 working dogs with their cancer-related bills. While we'd love to share all of their stories, we don't always get materials and information from their respective partners. But, when we do, it is wonderful! Below, please enjoy some of the partnerships that we have assisted. Your tax-deductible donations are integral to our provision of grants to help working dogs in need of cancer treatment. Donations can be made in any amount by clicking below on the "Donate" button. You may also designate in the comments area if you want to direct your donation to a specific dog referenced above. Robin (Am-Can Ch. Nitro's Boy Wonder SDHF BISS TDI CGC, Police K-9/Search and Rescue Dog), pictured in his Hope necklace below, is one of our grant recipients. The first Golden to win the American Kennel Club Humane Fund Award for Canine Excellence (ACE) in Law Enforcement, he with his handler, Mary MacQueen, specialize in Human Remains Detection, Narcotics, and Mantrailing. Robin and Mary were recipients of the 2008 Police Officer of the Year award for the Salamanca Police Department. In 2009 alone, Robin has been responsible for getting about half a million dollars worth of dangerous narcotics off the streets. Robin also provides Animal-Assisted Activities, as well as school demos on the dangers of drug abuse. During special events he can be seen carrying a donation basket or lunch box filled with candy for the kids. Robin was diagnosed with Cutaneous Epithelioltropic Lymphoma, an aggressive form of cancer, on October 15, 2010 — just two days after his eighth birthday. Despite a lack of medical coverage and treatment costs of at least $10,000, our fundraiser and Cancer Treatment Grant saved the day. 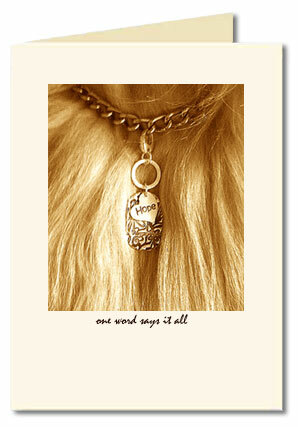 For those diagnosed with cancer, the embodiment of hope remains critical, Suzi Beber's necklace creation keeping this belief burning bright. Help with our Working Dog Cancer Treatment Fund and spread Robin's message of hope through these lovely cards. A hefty 80lb weight, 5¼" x 7¼" quality ivory linen card and matching 70-pound linen envelope is utilized. The card is blank inside to allow for your own personal message. 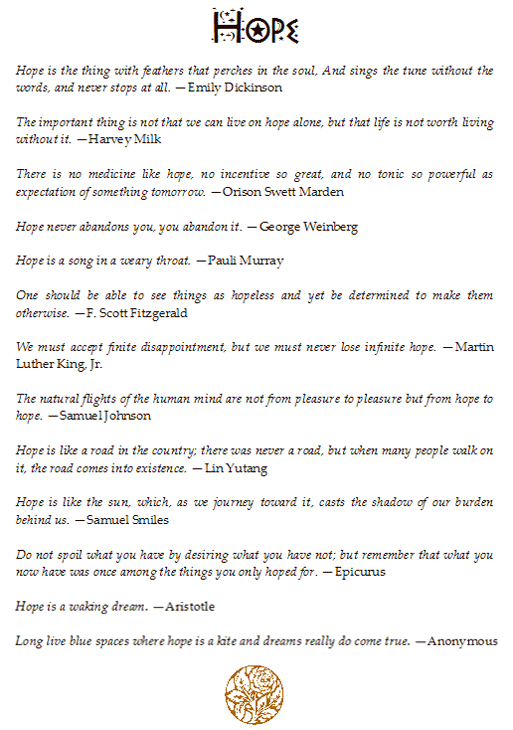 However, the left side provides the famous hope-themed quotations below. Ten puppy stickers are enclosed as a free gift, great to affix to envelopes as an embellishment or type of seal. Price: $45.00.